Ninjin: Clash of Carrots is an anime-inspired beat-em-up from Pocket Trap. The game has varied enemies and deep customization. Play as the rabbit Ninjin, or Akai, the ninja fox, and fight to retrieve the carrots stolen by Shogun Moe. Redeem carrots for weapons, upgrades and more. Play through side-scrolling worlds consisting of multiple stages and collect carrots stolen by the evil Shogun Moe. Carrots act as currency which can be redeemed in the Corgi Store for new equipment, or the Shady Shop for special weapons, masks and other customization items. Grab a friend to join you in 2-player online or local co-op. The game features over 150 weapons, projectiles, upgrades, and more to modify the experience to each player’s preference, it also features a unique survival mode called “Oni TV Show” where players will fight endless waves of enemies for rare rewards. If you get stuck in the game, check out the video walkthrough and gameplay for the game. 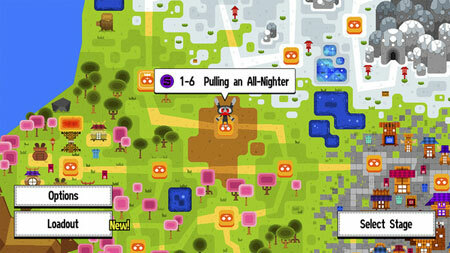 This entry was posted in PC Games, Walkthrough and tagged Ninjin: Clash of Carrots Cheats, Ninjin: Clash of Carrots Game, Ninjin: Clash of Carrots Gameplay, Ninjin: Clash of Carrots Guide, Ninjin: Clash of Carrots Hints, Ninjin: Clash of Carrots Review, Ninjin: Clash of Carrots Solutions, Ninjin: Clash of Carrots Strategy, Ninjin: Clash of Carrots Tips, Ninjin: Clash of Carrots Walkthrough by Marvin. Bookmark the permalink.